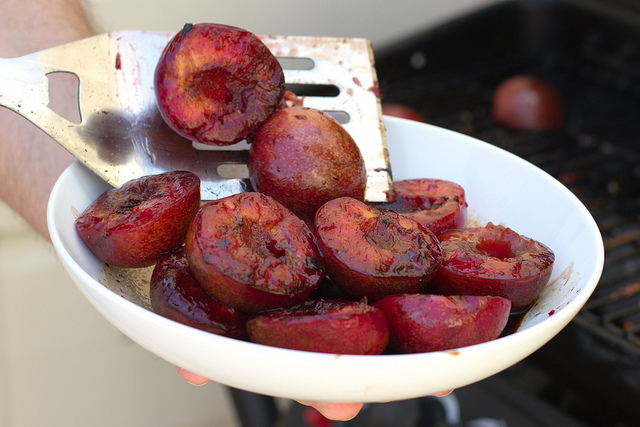 Ice cream is a guaranteed crowd pleaser when it comes to dessert on a hot summer night, but if you’re looking to take it up a notch, serve it over some grilled plums. Slice into a firm plum with a chef’s knife until you feel the side of the pit, then continue around the entire diameter so you end up back where you started. With two hands, twist the plum apart at the cut and dig out the pit with a small paring knife. Lightly oil the plum halves and dust them with a few pinches of cinnamon or cayenne pepper. Place them on a hot grill cut side up for a couple minutes, then flip and continue for another five. You want them caramelized on the outside and soft all the way through without being mushy. Serve immediately with ice cream.